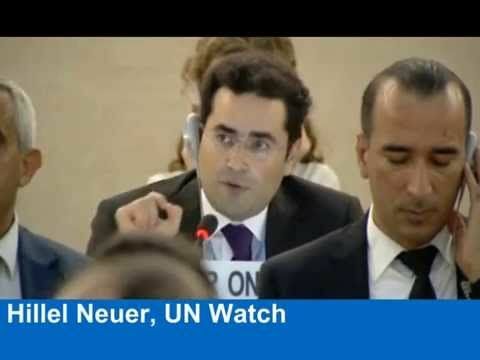 Hillel Neuer is the executive director of UN Watch, a human rights NGO located in Geneva, Switzerland. This week he was a guest of Beth Jacob Synagogue, in Beverly Hills California, that is holding an ongoing speakers series for the community. Mr. Neuer spoke to a large audience, all curious to know why Israel, the most bashed country in the UN, remains a member. From its anti-Israel activities, it certainly appears that the UN Human Rights Council would be a redundant body if not for Israel. It relentlessly works to find ways to pass resolutions that demonize and delegitimize Israel, all based on lies and detestation. Though the UN was founded to be an independent and impartial body, it is not. The fact is that whenever Israel has to go to war to defend herself, which she has been doing since becoming a sovereign state, the UN Security Council sees fit to open an inquiry on Israel’s conduct, never establishing a body to investigate the conduct of the aggressor, such as Hamas. The first proof is the UN Human Rights Council (UNHRC) commission, headed by Judge Richard Goldstone that was assigned to investigate Israel’s Operation Cast Lead and the actions of the Hamas terrorist group. The outcome was, j’accuse Israel. Now, again, the UNHRC has established a new inquiry commission to investigate Israel’s action in Gaza during Operation Protective Edge. The head of this commission is Professor William Schabas who is well known to have a biased opinion of Israel. One needs to ask, where is the UN fairness, impartiality and honesty? It has none! Ambassador Ron Prosor addresses UN General Assembly debate on the question of Palestine, a non-existent state several European states have announced a premature recognition of. Originally the UN was friendly towards Israel. After all it passed the resolution to declare Israel a sovereign state and later on accepted Israel as a member. Sadly, over time, the UN has changed. Many dictatorships have joined its ranks. The Arab states have failed to defeat Israel on the battlefield so they found a political avenue, through the UN corridors, where they and their cohorts have an automatic majority. The organization has become a major enabler of terrorism against Israel and more recently against other non-Moslem people around the world. It does not follow the moral authority it seeks and thus has become an amoral organization built upon generations of deceit, lies and corruption. UN attacks on Israel have gone so far that it has passed a resolution equating Zionism with racism, all in order to demonize and delegitimize Israel. The resolution was later on repealed but Zionism equated to racism remained to resonate worldwide. Words matter, words can kill. The UN is well known for its Israeli bias and favoritism of the Arab members, all hostile to Israel. To that end, each year, on November 29th, the day the UN voted to partition the land into a Jewish state and an Arab state, to which the Jews said “yes” and the Arabs said “no,” the organization holds a ‘UN Day for Palestine’ only for the purpose of singling out Israel. Noone else has such a day at the UN because no other country has a conflict with the Jewish state, Israel that can become a reason to attack Israel. The UN supposedly offers equal treatment of large and small nations and organizations but Israel is excluded. One must know that every resolution passed at the UN is translated into six different languages and is distributed widely among nations, diplomats, NGOs and influential organizations and millions of people read and remember its context. Words matter and they have influence, what is said in the UN matters. So no matter how much Israel is bashed, no matter how much the UN conspires to delegitimize and demonize Israel, the Jewish state must hold the candle of truth until things change in the United Nothing Organization; until countries become more democratic, oppose the dictatorships and malevolent governments that today make up the majority membership at the UN, all act according to real politic, better yet, surreal politics, each in its own interest – or because that country or another is simply anti-Semitic – and thus end up voting against little Israel. Hillel Neuer and Ambassador Ron Prosor are remarkable men; each, on his own, is the Judah the Maccabee of Israel representing the Jewish state in the halls of the Hellenistic United (Nothing) Nations Organization as a whole and Human Rights Council in Geneva, Switzerland in particular. The defenders of Israel will never slumber.